Home > Blogs > Adoption: Not Just My Profession, My Life > Famous Last Words: What’s the Chance It Will Happen This Week? We submitted our profile to our agency and officially became a waiting family in mid-March. Our agency has a high percentage (around 50 percent) of emergency placements—when the agency is contacted by a hospital for a woman who has just delivered her child and has decided to make an adoption plan. The general process for the adoptive family is the same; it is just at a faster pace with very little notice. Because we knew we could get "the call" at any time, and there was a good chance it would be an emergency placement, we knew we should prepare. Our agency requires families to go on hold during times they are unavailable for placement. My mother was ready to be our main source of child care for our two boys when we got the call, but there were nine days in late April when she was going to be away. So, in the spirit of being prepared to receive the call at all times, our first task was to find round-the-clock coverage for those nine days. We hoped to find enough childcare coverage while Mom was away that we wouldn't have to go on hold. 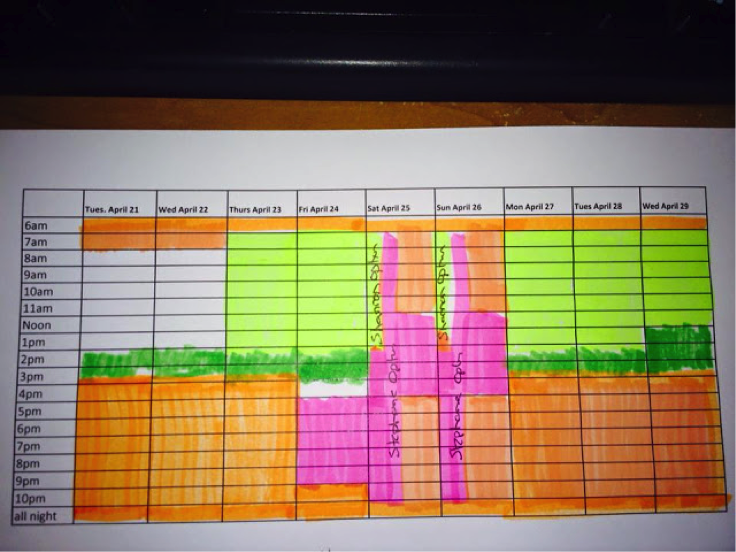 This is where my mad organization and color-coding skills came in handy. I assigned each available babysitter a different color. On any given day, I could immediately see which person was able to watch the boys for any hour of the day. On Monday, April 27, at 3:40 p.m. I had a knock on the door of my office and my social worker, Ashley, walked in. (Keep in mind that I work at the agency we are adopting through, so having our social worker come to my office isn't as shocking as it sounds). She said, "OK…this is it." Honestly, I had no idea what she meant. When I saw that she had brought in the new social worker, who was being trained, and shut my door, I became worried, but still didn't correlate her words with my personal adoption process. How could I not have known she was talking about our profile being picked? All I can say is that, even though I knew we could be picked any day, I didn't think it would happen so quickly. And I definitely didn't think my babysitter chart would actually get use. It finally clicked for me when Ashley said, "So, do you remember when you said this would be the worst week for you to get picked? Well, guess what?" I'm embarrassed to say that the new social worker was exposed to tears, giggles of excitement, oh, and quite a few curse words due to disbelief and excitement! Then came, "It's a Girl!" and the cursing accelerated. Ashley started rattling off all the details: when she was born, her height and weight, the hospital name, background on the birth parents, and tons of additional information (none of which I retained, so I'm glad she put it all in writing). She concluded with, "and you will need to leave at 6:30 tomorrow morning to make it to the hospital to meet the birth mother's social worker in the hospital lobby." This was a complete whirlwind. I'd spent the last 10 years working at the agency and hearing how wonderful getting the call was, but it still didn't feel real, like it was really happening...happening to me. To us; "Oh, that's right Dave, I have to call Dave," I thought. I wanted to catch him before his 4 o'clock client arrived. He was just as shocked as I was. I filled him in on the details and he said he would start pulling together everything we needed to pack after we put the kids to bed. Our early-morning babysitter arrived and we headed out. The whole ride down felt surreal. Were we really ready to meet our daughter? We pulled into the parking lot and greeted the birth mother's social worker and, within minutes, we were headed up the elevator to the nursery.